Use our Geami brown paper roll in conjunction with a special dispenser and tissue paper to create an extraordinarily effective eco friendly packaging solution. Also available in white, the packing paper is die-cut with slits so that when you draw it through the dispenser it’s converted into a 3-D honeycomb protective wrapping. Choose from white or black tissue interleaf to be dispensed at the same time for a classic or funky look. 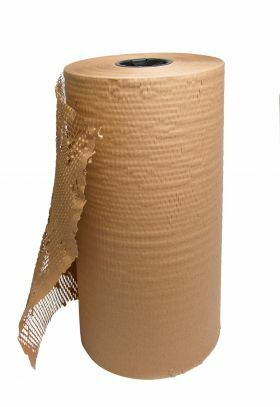 The Geami brown paper roll is made of strong Kraft packing paper, creating ideal natural shock-absorbent protective packaging. Biodegradable & Recyclable. 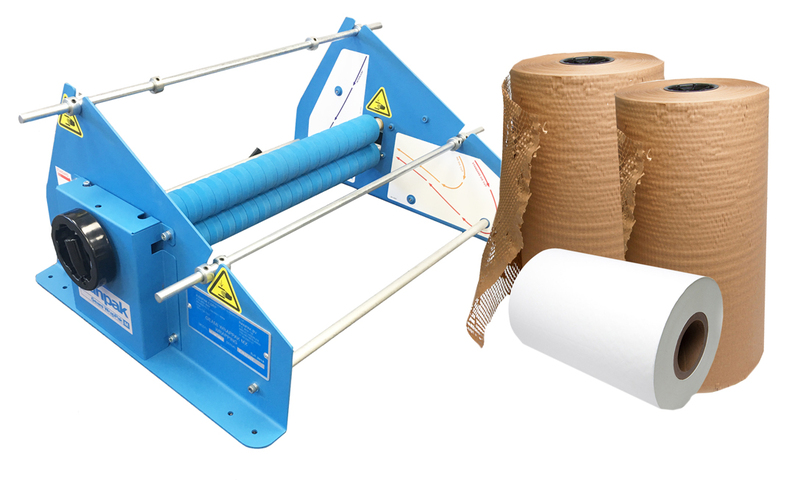 The Geami brown paper roll forms part of the Geami WrapPak system which provides paper bubble wrap, a superb organic alternative that offers both reliability and attractive in-the-box presentation. It is quick and easy, with the brown Kraft parcel paper converted and expanded into an extremely strong 3-D honeycomb structure when it is manually pulled through a Geami dispenser. Tissue interleaving is dispensed at the same time to add a smooth inner lining. 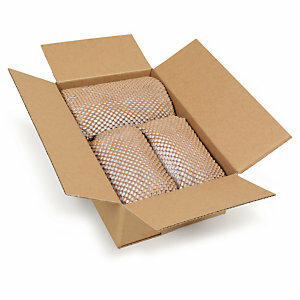 The honeycombed cell structure of the outer casing is formed from thousands of horizontal slits die-cut into the brown packing paper. The result is an incredibly robust yet flexible eco wrapping paper with excellent shock-absorbent properties, making it suitable for a wide variety of fragile and glass packaging, gifts and food. Easy to tear off from the dispenser, it can be moulded around objects, and secured by intertwining the angled cells. It can be tucked into the top of glasses or wound around large objects, crossing it over backwards and forwards for added protection. 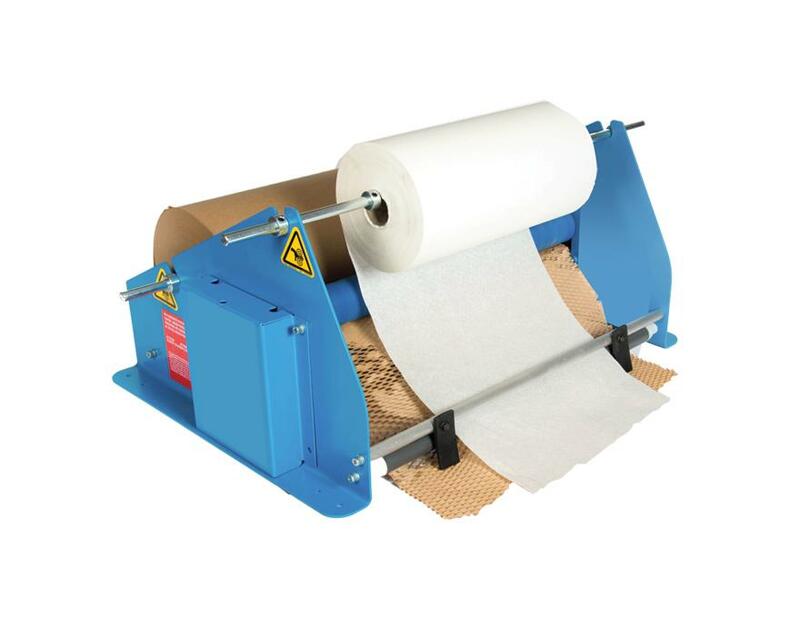 Smaller items can be wrapped individually or safely bundled together by wrapping each one along the dispensed paper. With no need for scissors or adhesive tape, the whole process saves time as well as being environmentally friendly. Also available in white, the Geami brown paper roll slots on to the dispenser holder where it can be can be combined with either a black or white tissue wrapping paper roll: a choice of colours that allows you to create your own designer wrapping!